My primary EDC knife for the past few years has been a plain-edge Emerson Mini-Commander. It’s a great little knife: an ideal size for EDC and extraordinarily tough for a folder. 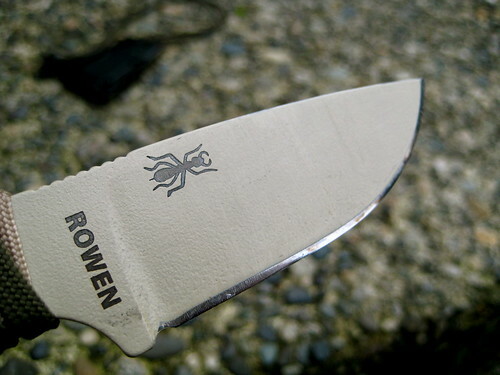 I’ve used it as a pry-bar a few different times on objects that I would be afraid to pry with some fixed-blade knives. The Mini-Commander is no worse for the wear. Still, I’ve often thought that I would like to EDC a fixed blade. After all, despite it’s toughness, the Mini-Commander is a folder and that gives it some limitations. I’ve also found that the grind and shape of the blade is not ideal for some wood-working and wilderness survival tasks. Making feather sticks with it isn’t easy. I have carried a small Nemesis Hellion around my neck most every day for the past couple years. It’s a fixed blade, but quite small. As I’ve stated elsewhere, I think of the Hellion as a novelty item and a fun toy more than a tool. It’s extremely concealable due to its size, but could by no means replace the Mini-Commander. Folding knives are fairly common and tend not to frighten many people. Fixed blades, on the other hand, are not so common out of the wilderness and rural areas. Now, I’ll admit that I have no idea concerning the legality of carrying a fixed blade in urban environments. I tried reading up on knife laws a number of years ago and quickly gave up – they are so convoluted and contradictory as to be meaningless. And so, for me, they are. I ignore them. So far that seems to work out pretty well. I don’t seem to recall granting any government the right to regulate a tool such as a knife, anyways. Still, I do concern myself with other people’s feelings and, as odd as it is, some people feel nervous around folks with fixed blade knives strapped to their hips. Even something like a nice 4-5” bushcraft blade on the belt doesn’t seem to fly in a city. I needed something more concealable, but still of a size large enough to be of some use. Two products immediately jump out as a perfect solution (well, three, but I can’t afford another Chris Reeve knife): the RAT Izula and the Becker Necker. Both knives are small and flat, which lends them to a number of different carry options, but large enough to function as utilitarian tools. The Izula is 6.25” over all, with a 2.88” blade and 3.37” handle. The Becker Necker comes in with a larger 3.25” blade and 3.5” handle for an overall length of 6.75”. For the slight difference in overall length, one would think that jumping on the Becker Necker for the larger blade would be the way to go. After all, that extra .37” of blade could equate to more utility. But in searching around the internet and reading a number of comparisons, it became evident that the RAT Izula was the favored knife. It seems to be the consensus that, comparatively, the Becker Necker has too little handle for its length of blade. I don’t consider my hands to be large, but they certainly aren’t small, and I know that having too small a handle could completely ruin a knife for me, regardless of the quality of the blade. So, I chose the Izula. The Izula can be purchased in two different packages: either the standard knife and sheath, which RAT asks around $80 for (way overpriced) but can easily be got for closer to $50 (a reasonable price) or as part of a “survival kit”. The “survival kit” starts with the same knife and sheath, but also includes a MOLLE lock, paracord, cord lock, snap, split ring, ferro rod, and whistle. RAT asks $100 for this complete kit (crazy) though $60-$70 seems the going rate for most merchants. The “survival kit” did not appeal to me. I already have paracord, ferro rods, cord locks, and split rings. The only useful item in the kit seemed to be the MOLLE lock. I decided to save the money and get only the basic knife and sheath. The Izula also comes in four different colors, which is a bit fun: black, desert tan, olive drab, and, best of all, pink. I was quite tempted to get the pink, especially given my concern over other people’s feelings of fixed blades. Who could be afraid of a man with a pink knife? But it turns out that I was able to find the desert tan knife for less money on eBay than I could get the pink knife for, so I went with tan. The flat ground 1095 steel takes an edge very easily on my Japanese water stones. With the stones and a leather strop, I can get Izula as sharp as my high-carbon, scandi-grind, bushcraft blades. Scary sharp. In fact, the knife is very, very impressive in what it can do. Its only limitation is its short blade and, for longer sessions of use, the bare, skeletonized handle. 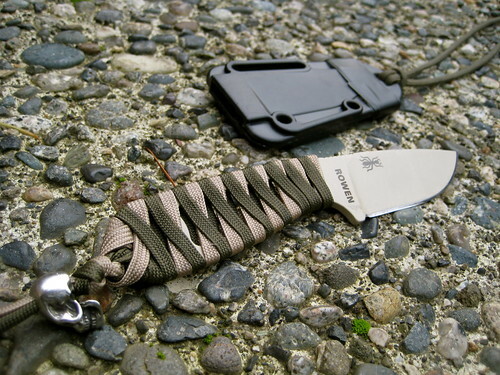 When I first got the knife, I took some olive drab paracord and wrapped it in the way instructed on the back of the Izula instruction sheet. 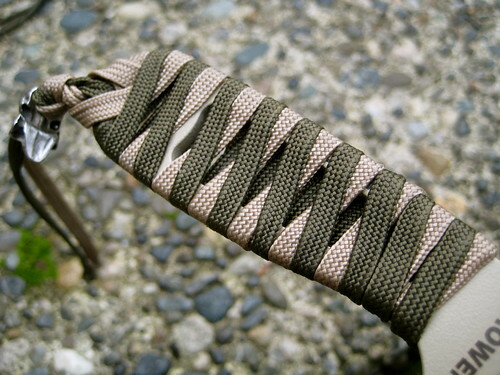 The current paracord wrap that I have on the handle is a 180 degree katana wrap. I first did this with normal paracord, but found that it made the handle a little too thick, so I went back and did it again with gutted paracord. That worked out better, but, being gutted, the paracord does not add a whole lot of extra padding. At the end of the day, the katana wrap is more for looks. The wrap that RAT recommends is a more practical way to pad the handle and carry spare paracord, but it doesn’t look anywhere near as cool! At the end of the handle, I finished the wrap with a simple overhand knot. I had a unused skull bead laying around, so I decided to leave the two tail ends of paracord a bit long and thread the skull bead through them. By sliding the skull bead to the end, I create a loop for my wrist. Rather than tying the ends of the cord together, I tied an overhand knot in each one separately, which prevents me from accidentally pulling the bead off, but also means that I can slide the bead to the top and just have two loose ends of cord, rather than a loop that will no doubt get caught on things. Honestly, I’m not a big fan of wrist lanyards on knives. I rarely ever use them. But I am a fan of skull beads. Like the rest of the wrap, this lanyard bit is on there just because it looks cool. The sheath itself was the surprise in this whole package. 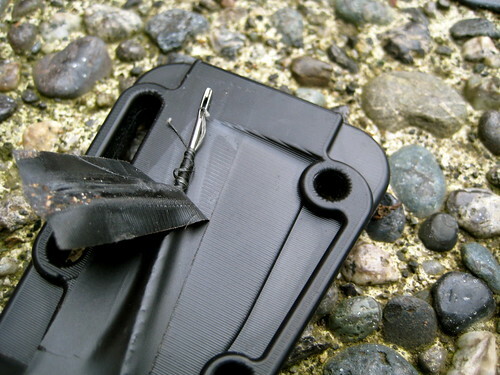 It is some sort of “injection molded thermoplastic” that is supposed to be more cold tolerant than Kydex. I’ve never had a problem with Kydex in the winter, but apparently extreme cold makes the Kydex brittle and prone to crack. The fit of the sheath was what most impressed me. It is, without doubt, the best fitting sheath I have ever had for a knife. The knife pops right in there and is completely locked – no wiggling or movement what-so-ever. I’ve taken a size 14 sail-making needle pre-threaded with a length of black Kevlar thread and taped this to the back of the sheath with a piece of electrical tape. Dave Cantebury did this in a video on a Mora knife sheath a few months back. I thought it was a great idea. It doesn’t add any noticeable weight. Even though I carry a sewing kit in my possibles pouch, I’ve since taped a prethreaded needle to the back of all my plastic knife sheaths. (Tape doesn’t stick too well to leather, so I haven’t figured out how to carry a needle on my leather sheaths). Around the bottom of the sheath, I wrapped a bit more electrical tape (I was out of 1” duct tape at the time). There probably isn’t more than 2 or 3 feet. It never hurts to carry extra tape! 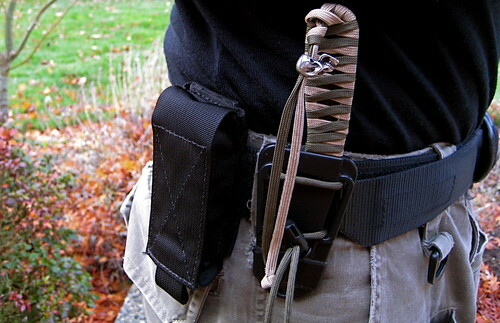 Some people have complained about the sheath because it doesn’t come with a belt clip of any sort. This worried me as well. I wasn’t sure that I would want to carry it around the neck all the time and, since I didn’t go for the expensive kit that included the MOLLE clip, I did not know what other mounting options I would be able to come up with. It turns out that with only a cord lock (self supplied out of my repair box, since I didn’t get the “survival kit”) and a little over two feet of paracord, the sheath becomes remarkably configurable. 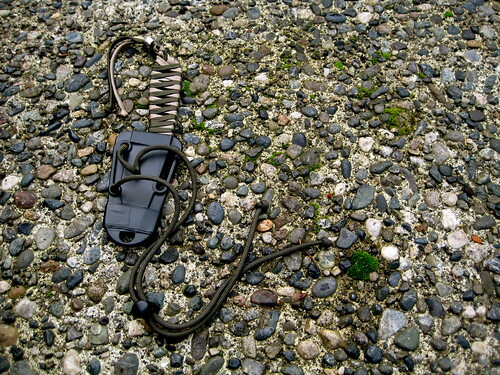 To carry it around the neck, I simply slide the cord lock over both ends of the paracord, put the cord through the top hole in the sheath, and loop it through itself. The cord lock allows me to adjust how high or low it sits on my chest. As with the wrist lanyard, I put an overhand knot in each end of the paracord to prevent me from accidentally pulling the cord lock off, but refrain from tying the two ends of cord together. I don’t want to create a secondary, smaller loop on the back of my neck for things to get caught on when I adjust the cord lock up. As I mentioned above, I initially thought that I might not want to carry the Izula around my neck. It’s a good deal bigger, heavier, and bulkier than the Nemesis Hellion neck knife that I’m used to. But I was pleasantly surprised. The profile of the knife is slim enough so that it can almost completely disappear under only a t-shirt. Unlike the Hellion, you are probably not going to forget that it’s there because of the weight, but it is by no means uncomfortable. A lot of folks who carry a neck knife go on about the danger of using knotted paracord as a lanyard. Paracord is very strong. Someone sneaking up from behind could grab the cord and strangle the wearer rather easily. If this concerns you, you could use some weaker cord (or chain), tie a slip knot, or invest in some sort of break away device. Personally, I’m more concerned with the security of the knife around my neck (which sort of rules out slip knots) and I like the simplicity of this system. In the years that I have been carrying the Nemesis Hellion around my neck on gutted paracord, I have yet to be strangled. But it is something to be aware of – especially if you find yourself getting in a tussle fairly frequently. Do remember, though, that the paracord around you neck is attached to a knife, and knives cut things. 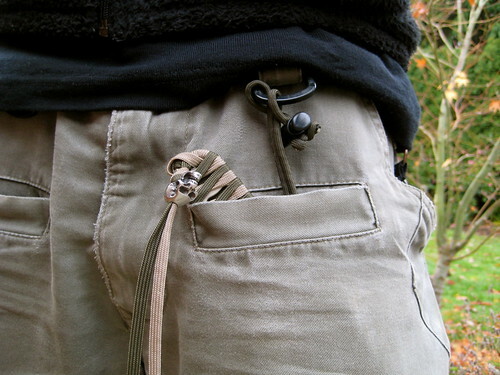 My favorite way to carry the Izula is in one of the two front pockets that Triple Aught Design places on their pants. In my Legionnaires, I carry the knife in the left front pocket. It sits in the pocket rather securely, with only the top half of the handle exposed, leaning to the right. This allows for a very fast, right-handed cross draw. I have the paracord and cord lock setup and attached to the sheath the same as in the above neck carry option, but in this setup I’ll put the cord through the plastic D-ring above the front pocket and loop it through itself so that the sheath and knife are securely attached me. Normally, when I draw from this setup, I’ll grab the handle and push against the sheath with my thumb, popping the knife free. But because the cord is attached to the D-ring, I can also just grab the handle and yank it to my right, extending the cord till it reaches its full length and pops the knife free. Personally, I feel that this is too obtuse a movement, so I prefer popping the knife free of the sheath with my thumb. If you prefer the latter option of yanking the knife, you could move the cord lock a few inches up the cord, thus shortening the distance you have to pull before fully extending the cord and popping the knife free. I will usually leave the cord lock all the way against the knots at the end of the cord and stuff the excess amount of cordage in the bottom of the same front pocket. As much as I prefer the above option, not all of us wear TAD pants every single day. 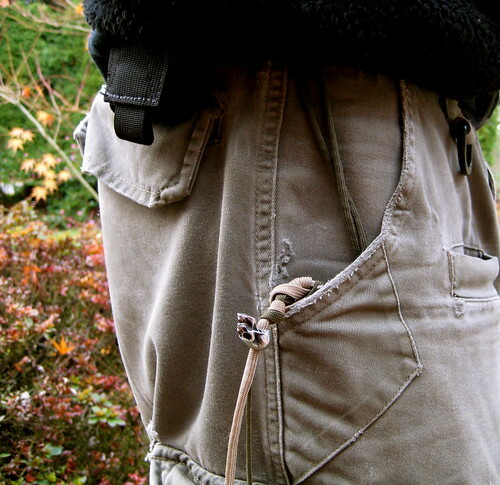 When wearing another pair of pants, I will carry the Izula in the right side pocket, tip down. I found that most pockets are sized so that the tip of the sheath reaches the bottom of the pocket with only about the top 1/4” of the handle sticking out. Again, I keep the paracord and cord lock attached as before, with the cord lock slid all the way against the knots at the end, creating a big loop. This loop I run through my belt, guaranteeing the the sheath and knife are securely attached to me. To draw, I reach my hand in the pocket, grab the handle, and push against the sheath with my thumb, popping free the knife. I’m required to get my whole hand into the pocket to grasp the handle, which makes the knife slightly slower to draw than a folding pocket knife clipped into the same pocket (especially compared to an Emerson with the wave feature, such as the Mini-Commander). Because the cord is attached to my belt I could just grab the handle and pull out or up, extending the cord till the knife pops free, but this is even more obtuse a movement than when drawing in the same manner from a front pocket. I’m not a fan. 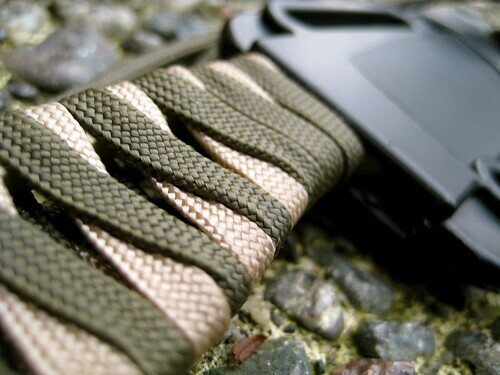 The paracord and cord lock really become useful when you decide you want to carry the Izula on your belt. The first step is to unloop the cord from the sheath. Then remove the knot in either end of the cord so that the cord lock can be removed. Next, thread either end of the cord through the two holes in the side of the sheath and the reinstall the cord lock, retying the same knot in either end of the cord to prevent the cord lock from being removed. Move the cord lock about halfway up the cord, grab a bit of the cord and pull it through the large slit opposite the two holes on the sheath. 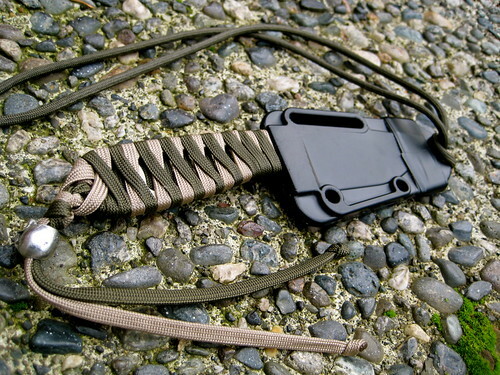 What you now have on the front of the sheath is a line of paracord crossing the top horizontally and, on the bottom, the cord coming together horizontally to the cord lock. On the back of the sheath you have two vertical loops that you can thread your belt through. With the sheath attached to your belt, you can then move the cord lock tight against the sheath, pulling as much paracord through the lock as you can. The Izula will then be mounted on your belt. 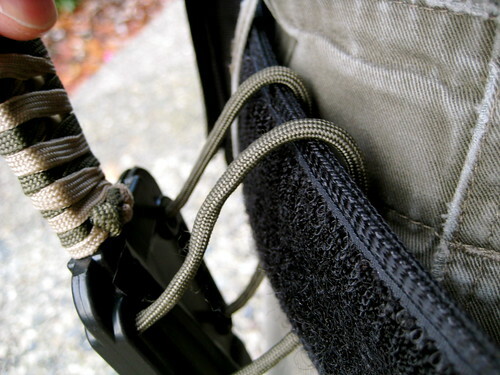 When I first saw this carry option pictured in the manual that RAT provides with the Izula, I was skeptical of using the paracord this way. I didn’t think that you could could get the paracord tight enough to eliminate any wiggling or movement. I’ve now carried the knife a good deal like this and I am perfectly happy with it. 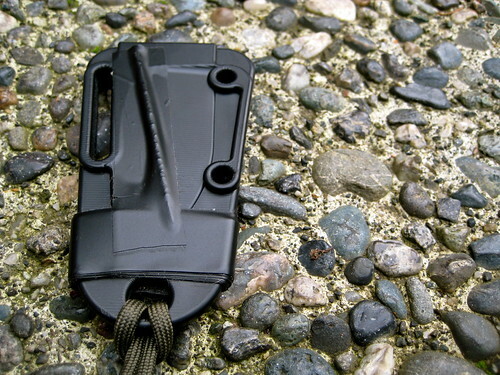 The sheath is just as secure as a sheath with a belt clip or malice clip (albeit easier to cut off). If you keep it attached to your belt consistently for a few days, the cord lock will eventually slide down a bit, loosening up the cord and causing the sheath to move a little when the knife is drawn. This can be addressed by checking the tightness of the lock once a day every time you put on your pants, which I don’t think is too much to ask. The downside to this method is that, because we’re using the same piece of paracord as we use when wearing the knife around our neck, the paracord is necessarily long. You will have 6” or so or cord dangling below the lowest point of the sheath. This would be a problem if the two ends of the cord had been tied together, forming a loop, but because they have not been tied thusly, the two ends are loose and will not get caught on anything. They don’t bother me. The spine itself is .156” thick, with about 1/2” of a grooved thumb ramp at the start of the blade. I’ve never found these thumb ramps to be necessary on any knife, but they don’t get in the way, either. 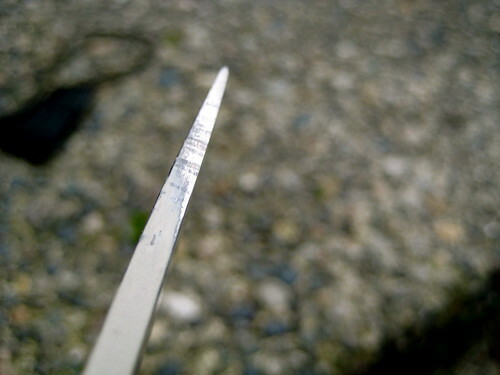 Initially, I found that I could not generate any sparks by sparking the spine of the Izula against a ferro rod. I know 1095 is high-carbon, so I figured it must either be the tan-colored paint that was preventing me from getting any sparks, or the corner of the spine was slightly rounded. To address both potential problems I set the spine flat on top of a coarse silicon-carbide stone and slowly ground down the first 2” from the tip. This removes the paint and squares off the edge, giving a 90 degree angle that should be ideal for striking sparks. With that change made, the Izula will throw a decent shower of sparks. I’ve been EDCing the RAT Izula for just over two months now. So far, I have been extremely impressed with the knife. Unless I am for some reason forced to carry a folder instead of a fixed blade, I doubt that I will go back to carrying the Emerson Mini-Commander. Direct comparison between a fixed blade and a folder is not exactly fair since they have both been designed with different intentions and are markedly different tools, but I find the Izula to be a superior knife. If I woke up in the zombie apocalypse, I’d much rather find the Izula in my pocket than the Mini-Commander. This post was published on 2009-12-01 . It was modified on 2012-09-15 . It was tagged with edc, review, survival, knife, gear.